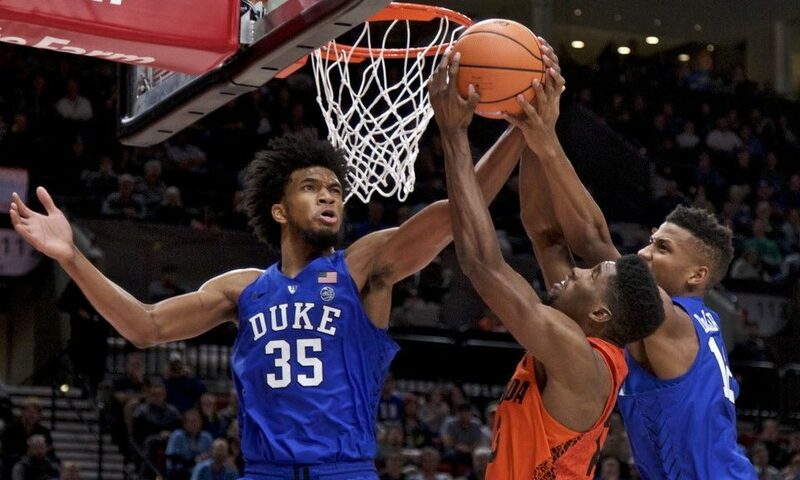 DURHAM, N.C. – Duke freshman Marvin Bagley III has swept the ACC basketball weekly awards, earning both Player and Rookie of the Week following his MVP performance at the PK80 Invitational in Portland. No. 1-ranked Blue Devils (8-0) have garnered six of seven ACC weekly honors in the season’s first three weeks. 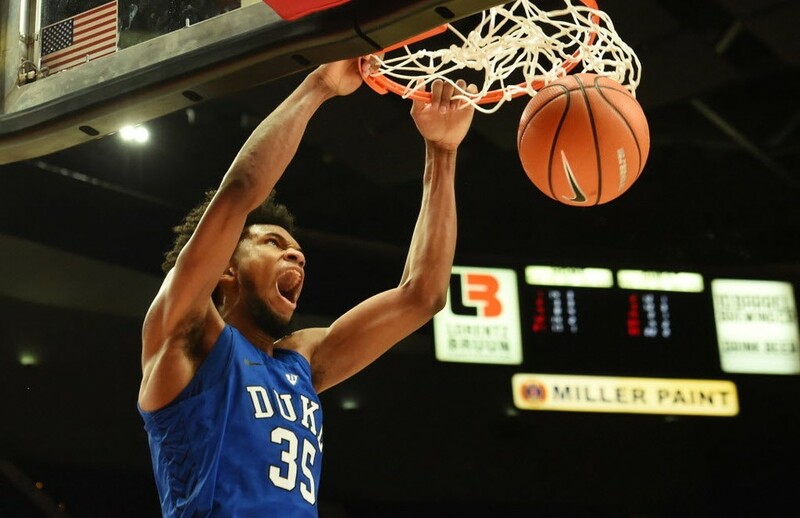 Bagley III, the ACC’s leading scorer (22.3 ppg) and rebounder (11.3 rpg), was both co-Player of the Week and Rookie of the Week on Nov. 13, while senior Grayson Allen and freshman Wendell Carter Jr., were Player and Rookie of the Week, respectively, last week. 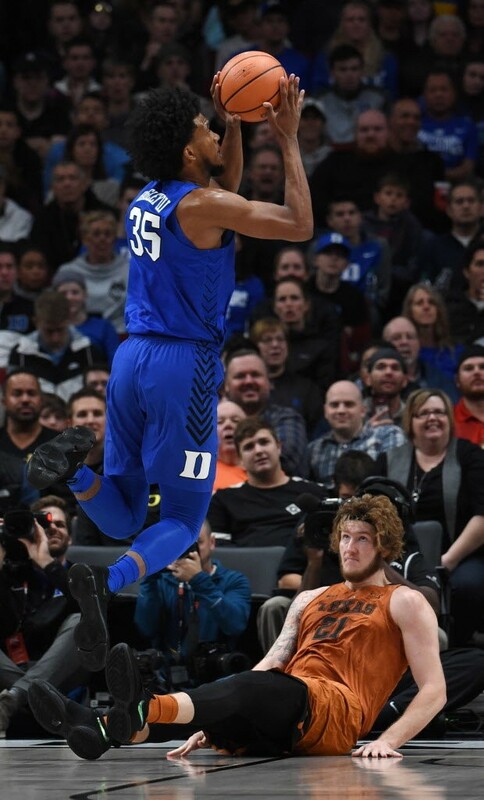 Bagley was named the Most Valuable Player of the eight-team Motion Bracket in leading the Blue Devils to the title. In four games last week, he scored 106 points and grabbed 53 rebounds, averaging 26.5 points and 13.3 rebounds. He is the first Duke player since 1973 to post three consecutive games of 15+ rebounds and is the first Duke player in history with consecutive performances of 30+ points and 15+ rebounds. Bagley had 34 points and 15 rebounds in an overtime PK80 semifinal win over Texas, including eight of the team’s 12 points in overtime. He followed with 30 points and 15 rebounds in Sunday night’s win over No. 7 Florida in the title game. The 34 points versus Texas tied Duke’s freshman scoring record (J.J. Redick vs. Virginia in 2003). Bagley’s six double-doubles are tied for the most in the NCAA. For the week, Bagley shot 60 percent from the field and 71 percent from the free-throw line, including 9-of-10 in the PK80 title game. He added seven assists, four blocked shots and two steals last week. 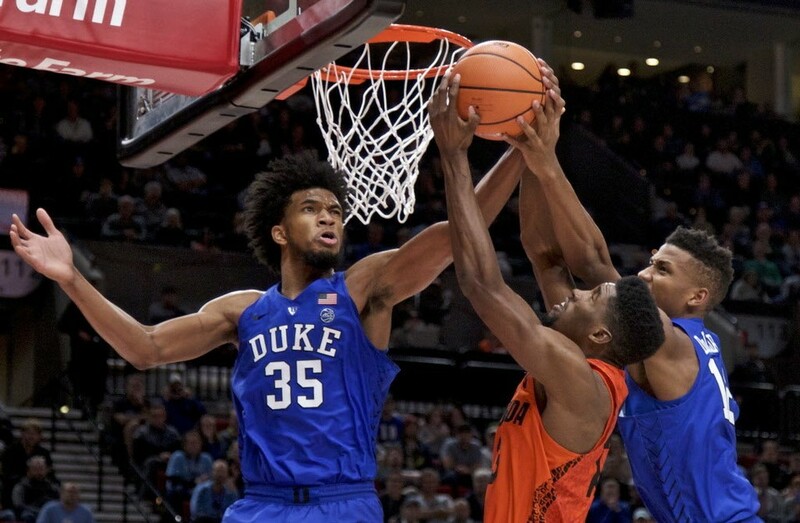 Marvin Bagley III was named MVP as the Duke had a comeback win over Florida in the PK80 Motion bracket final. There is something about this years Duke Basketball team that allows them to stage epic comebacks against good teams. After an overtime victory over Texas on Friday, the Blue Devils gained an even more impressive win over a top ten team in the Florida Gators. Florida held the lead for more than 34 minutes of the game and they built a 16 point advantage over Duke in the 2nd half. But these Blue Devils did not fold and played through fatigue to go on a 15-2 run over the last 4:04 of the game for a 87-84 win. Duke has a way of wearing teams down and hanging around just close enough to make a comeback. But they were playing high level competition against a Gators team that will contend in the SEC all season long, so valuable lessons were learned. After a painfully slow offensive start the 2nd half, Duke warmed up as did their defense. The Blue Devils would go back to man to man and that held the highest scoring team in the nation in Florida to just 31 points. Duke put game pressure on the Gators as they did the Longhorns and much of that is from the play of their outstanding freshman, Marvin Bagley III. The soon to be first pick in the coming NBA Draft scored 30 points while pulling down 15 rebounds. Bagley was named the PK80 MVP after scoring 82 points and pulling down 45 rebounds in 3 games. The young man is a match up nightmare while remaining a good team player. The Florida defense held Grayson Allen and Gary Trent Jr. scoreless for most of the 2nd half. But when the two players came alive it was during some of the games biggest moments. Allen (14 points, 7 assists) would knock down back to back 3 pointers during the comeback. Trent (17 points, 2 blocked shots) knocked down two free throws to give Duke an 85-84 lead with 1:12 to go, then made a steal with 11 seconds left and sank two more free throws to seal the win. All of the Duke players who played contributed. Duke got good minutes from Javin DeLaurier, Wendell Carter Jr., Marques Bolden, Alex O'Connell and Trevon Duval. The Gators held the edge on the boards for much of the contest, but Duke was tough on the glass during their 8-0 run to end the game. They ended up holding a 43-36 rebound advantage when the dust cleared. Two key factors played a role for Duke. Firstly, going 19-20 from the free throw stripe was their best showing of the season in that department. Secondly, Duke was hot from beyond the three-point stripe hitting 10 of 23 attempts. Duke also shared the ball well with 20 team assists. More importantly, they remained poised even when they were not playing well. When you have a knack for continually chipping away at teams, good things will happen. The Blue Devils celebrated the victory at mid court where Phil Knight awarded them their trophy. The Duke team is likely heading for their flight as I type and will arrive in Durham mind morning. Duke will soon have played 9 games in 20 days during a brutal scheduling stretch. They will go to class on Tuesday afternoon before heading to Bloomington, Indiana to take on the Hoosiers in a game that tips off this Wednesday on ESPN at 9:40. With tonight's win, Duke moves to an impressive 8-0 on the season and will remain the nation's top ranked team. Duke Coach Mike Krzyzewski continues to build on his record as having coached the most games as the top ranked team in the land. All in all, it was a great learning experience for a young team as they played three game opponents and varying styles of play in four days. Duke is far from a perfect team but they are certainly a special team which has plenty of upside moving forward. As fans we get wired after big wins and that is exactly what happened to many in the Blue Devil Nation after Duke staged a rollicking comeback win. Duke moved to 7-0 on the season but not before the emotional meter ran from one end to the other for the team and those who watched. Looking at twitter timelines show many fans going from ranting on the team to sheer elation in a matter of minutes. Yes, it was that kind of day and proof that one should never count any Mike Krzyzewski basketball team out. But even Krzyzewski seemed thrown aback from the turnabout where he admitted his team could have folded being down 16 in the 2nd half with just over ten minutes to play. Thankfully, Duke saved their best play for when their backs were against the wall and came away with a fine victory. One thing for certain is that everybody knows who this young man is now. 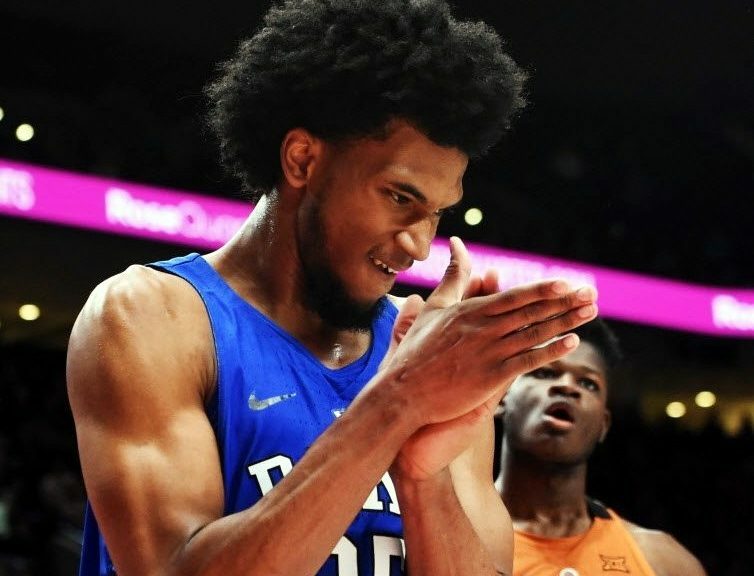 It is amazing how many in the media did not seem to realize just how good Bagley not only is but will be. In short, he is a special player and perhaps, dare I say, the best to wear the royal blue uniform? Okay, I will back up and not get ahead of myself. Thankfully, Bagley despite his immense skill set is a humble young man. In the post game locker room he admitted that he could get better and that he is still learning the game. So, maybe a new lesson or two will lead to 44 points instead of 34? Anyhow, his numbers were 34 and 15 against a good team. And he now has five double-doubles on the season. Our stinger covering the game got to listen to Bagley answer several questions about his recent eye injury. Seth Davis peppered the star with multiple questions about that and the incident did indeed bother Bagley more than some might think. Bagley's play left many media types simply saying he was a pro. Some fumbled for words when describing his play.. One ESPN announcer said he was a sure top five pick. Top five? Maybe he had been watching football. While some of you were cutting z's last evening, Florida and Gonzage were putting on a show of their own. The Gators remained undefeated with a thrilling and hard-fought double overtime win over the Zags. In their 111-105 victory, Florida was led by three main scorers which are all guards. Jalen Hudson led the way with 35 points while playing with foul trouble. Chris Chiozza added 26 and KeVaughn Allen chipped in with 23. Did I mention these guys consist of one experienced senior and two juniors? And to add a little more of a twist to this upcoming game, Duke Athletic Director Kevin White's son, Mike White is the Florida coach. Yep! Kevin has had to face this before and insisted it is all about Duke for him when I asked before a previous match up. But man, his nerves will be in a bunch during what should be a great game between top 10 teams. Oh, and one last thing. Florida (5-0, ranked 7th) has scored over 100 point in 4 of its 5 wins. That tid-bit translates as they are the highest scoring team in the nation. The teams participating in the PK80 have been quite busy with no time off. All of them visited the Nike Facility upon arrival and have spent most of their time preparing for great opposition. 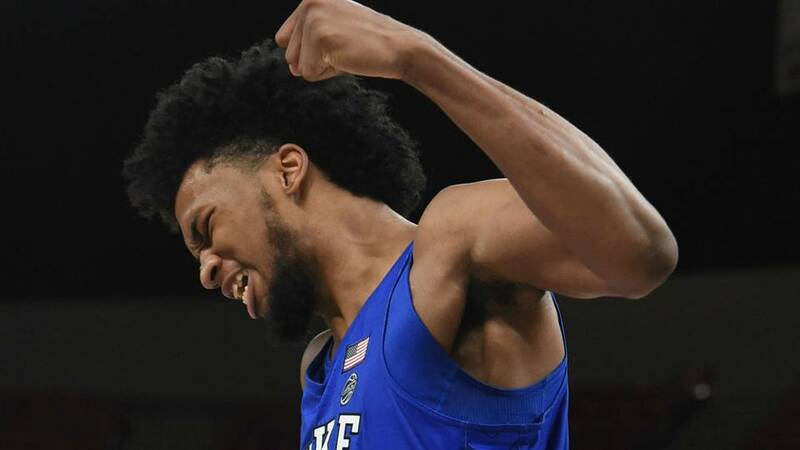 BDN Factoids - Marvin Bagley has 5 double-doubles in 7 games for Duke. For those who are not familiar, the assistant coaches will take in the next opponents game. That means Jeff Capel and company were up late last night watching Florida defeat Gonzaga. Now with that said, Duke had a long journey to get to Portland and left the day after a recent win over Furman. But Florida had a slightly longer journey per flight logs. And now we have two east coast teams which will tip-off tomorrows game at 10:30 EST. 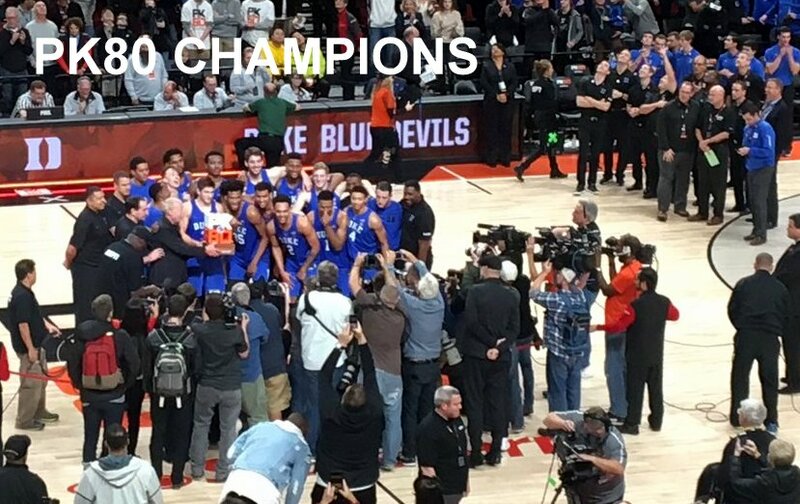 Win or lose, celebration or not -- Duke will then board a flight which will put them back in Durham, N.C. on Monday morning around 9:00. So, if you are thinking about greeting them know they'd probably appreciate a low-key walk to the dorms before class. Duke basketball will then have to adjust to east coast time again and wake up the next day to leave for Bloomington, Indiana. And there, they will face an improving Hoosiers team in a game that tips at 9:40 or later. They will then return to Durham well after midnight and have a little off before facing South Dakota at home on December 2nd. They will take on St. Francis the 5th and then travel the next day to Boston to face the Eagles at 12 noon in their ACC opener. That is the way it is when you are a cash cow for Nike and ESPN. The good news is after the game with Boston College, the team gets ten well needed days off. 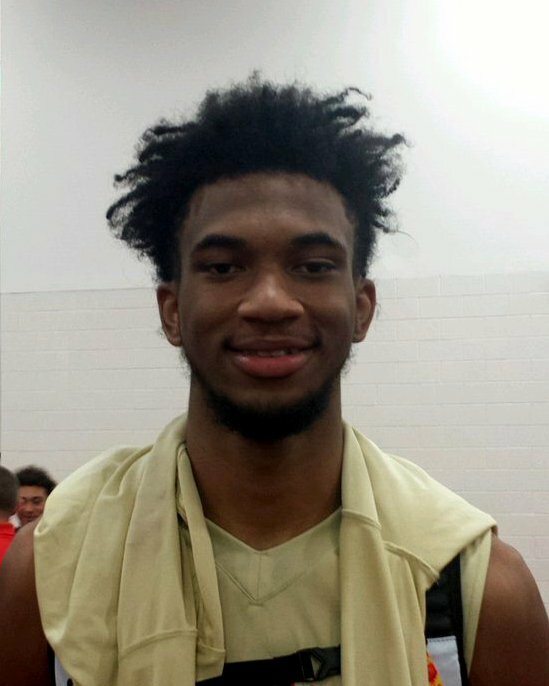 While his Nike Phamily team struggled as they opened up the Nike EY BL season, Marvin Bagley III put up his usual stellar numbers. There are times when he does difficult things effortlessly on the court and that has the prospect ranked in the top five by every service. Bagley would average 25,5 ppg and grab just under 15 rebounds per contest. There was little help from his teammates where there is not another double figure scorer on the team. That meant a 0-4 record and the strong possibility that his team will not make it to the Peach Jam come July. The talented young man also averaged 2 steals per contests to go with 3 blocks a game. The aforementioned stats show that he is a monstrously talented young player who will in tine flourish at every level. Bagley plays under the watchful eye of his father who critiques him and strives to keep him level-headed. 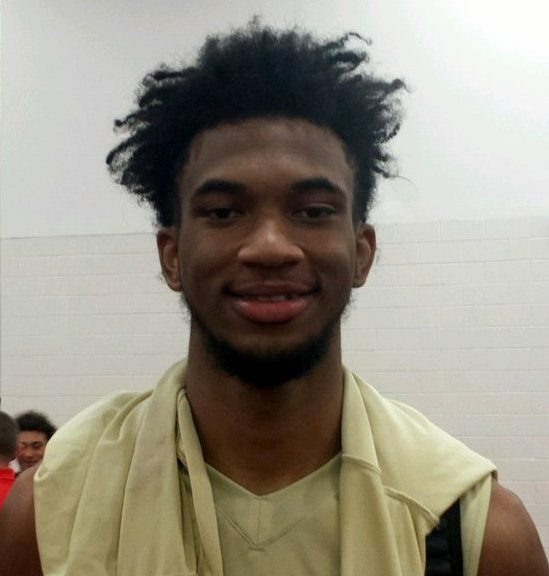 A season ago, he would be in on every question and answer session but this year Bagley III is handling the situations on his own. How can you help your team turn things around after a slow start to the season? 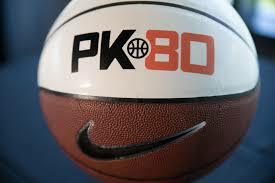 What do you personally want to improve upon the most the rest of the NYBL season? I want to be a leader. That's on thing I am focussing on. I am working on everything, but one thing is being a leader. So with the losses, I put it on my back and have to find a way to communicate better. We'll get it straight. I'm really excited about the future and we have got a long way to go. We have to get over this hump and play better. Are you training with anybody...like beyond you Dad when you have some little down time front his? I work out with my Dad and a man named Earl Ramsey. So I work on my body with sit ups and stuff and the game itself. Everybody is coming after you college wise. Who are some of the teams which are most aggressive with their contact? You know, I can't really tell you right now. Right now I am just focussed on winning games but when it gets down to the end of the year I will know more. After that, I will figure everything out. Have you discussed with your Dad when you will get a little more serious on that or do you kind of leave some of the communication up to him? Yeah, I mean we are worried about the same thing so we are on the same page there. But he is talking to some coaches. We'll sit down and talk about it more as things move along. Do you think you'll take the route of using all five of your official visits? I don't know, I really don't know. I have visited some schools unofficially already but there are some schools I have not looked at so they might get an official visit. Which schools have you visited already? I visited UCLA, USC, Arizona, Duke and I have got to visit Kentucky and Kansas. A lot of my readers are from the southeast. What do you think of Duke and Kentucky. What do you think about Duke first? Duke is a great program. I mean when you mention Duke everybody knows the great history and about Coach K and he has had a lot of great players come through that program. Duke is a great place, it pretty much speaks for itself. Have they talked to you or your Dad...I mean what is their message to you? They tell me to just play my game and they'll put me into a position to do what I do best. Same thing. It's a lot of success when you speak about Kentucky and Coach Cal, Davis and all the great players that have come through Kentucky and are in the league right now, so thee is a lot of success and that is a good place. Those two schools have the most players in the NBA right now. Is that an advantage for them to have had success in getting guys into the league, especially with the way they work with one and done players of late? It is a plus. You know, the competition they play at and getting to the tournament and the atmosphere...I went to Cameron Indoor and the atmosphere when I went there was great and I want to be a part of something like that. So, whenever I sit down with my parents and figure out where I want to go, I want to be a part of something with atmosphere like that. You guys are west coast folks, so what about location or would it be an advantage to stay west or close to home like at Arizona? I will go wherever I can get better and to a place that can get me to where I want to be in the long run. So wherever that may be, east coast or west coast. What are some of the things that help you stay grounded in life. I am sure everybody wants to come at you from hanger ons to girls and such. I see a guy just came up to you with a folder full of pictures seeking autographs and your Dad had to intervene after you signed one. I keep my circle small with people who have been there with me from day one. My circle has gotten a bit smaller and so I am careful not to let too many people come in. So, I am just a quiet guy who lets his game speak for itself. Quiet and laid back...can you elaborate on that a little bit? Off the court I just like to play a little and work out, I am just a regular kid who hangs out with his teammates on the road and classmates when at home. I just like to have a little fun. That is really all you have time for. I mean you ball pretty much year round. Will you be going to the same high school this year or do you know? Umm, as of right now I am but you never know what might happen in the future. Obviously, you are looking to get to the NBA. That means you will be a one and done like kid, everyone is labeling you for that. And you're okay with that, right? Yeah I mean, whatever helps me to ge where I want to be. I can't look too far ahead though and get caught up with what some say I am as a player. Some days they say I am number one other days I am top 100 so... Rankings don't make you who you are. No matter what people say, I know how hard I work and what kind of person I am and give it everything I have. You seem like you have matured a lot on and off the court since last season. Would you say that it true? Yeah, man. I have been hanging around older kids my whole life and always playing up in age groups. So I am learning a lot on how to be a leader and it's working out for me. I just try to sit back and learn what I can along the way. So, there is no animosity or the feeling you have lost some childhood along the way? No, you know I understand it is sometimes a sacrifice. You have to sacrifice a lot when you want to be good. So, you are focussed on the big goal? Yeah. you gotta put away some things that other kids do, but that's the way it is. He is a very well spoken young man where his answers float off his tongue with sincerity. He is upbeat off the court and clearly grounded mentally for his age. I will have more comments from his Dad at a later date. Coach Krzyzewski watched his entire game on Saturday and it is clear that despite what some are reporting that he is on the radar. It is clear that he is one and done and that his decision will come about in a slow manner, but he said good things about Duke with me not exactly pulling it out from him. His teammates stand around too much waiting to see what Marvin does per his father who films his son a lot while actively coaching him from near the bench. His mom is always very close by as well.